AMES — There were large chunks of Iowa State’s 79-53 victory over Alabama State on Tuesday night that were pseudo ugly. However, when the Cyclones were sharing the basketball and playing under control, the potential of this squad was quite simple to realize. Here are nuggets from my notebook on the opening night of the 2018 Cyclone men’s basketball season. 1 – First things first: The bad news. After the game, Steve Prohm announced both Cameron Lard and Zoran Talley will be out for the entire month of November due to disciplinary reasons. Add Solomon Young’s groin injury to the equation and the Cyclones are all of a sudden really small, really young and not very deep. “It’s the cards we have and these guys have to respond,” Prohm said. The only positive to come from this is the Cyclones say they are prepared for it. Lard was away from the team all summer at a treatment center on the east coast. Young nursed a separate injury during the same time. 2 – If the Cyclones were entering the season at full strength, it isn’t difficult to imagine a scenario where George Conditt would redshirt. Listed at 6-foot-10, 216-pounds, Conditt scored five points with an impressive four blocks in 14 minutes. 3 – The overall positive I took away from the opener is the obvious upgrade in talent from this year’s roster compared to last. We all knew this was coming but it was great to see tangible evidence on the floor in a real game. 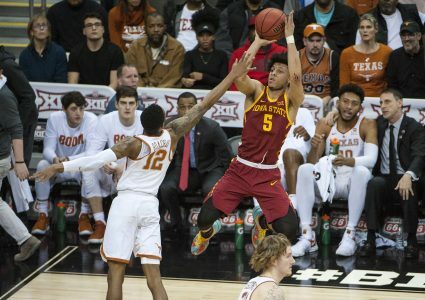 All four of Iowa State’s freshmen – Talen Horton-Tucker, Tyrese Haliburton, Conditt and Zion Griffin – contributed to the win. 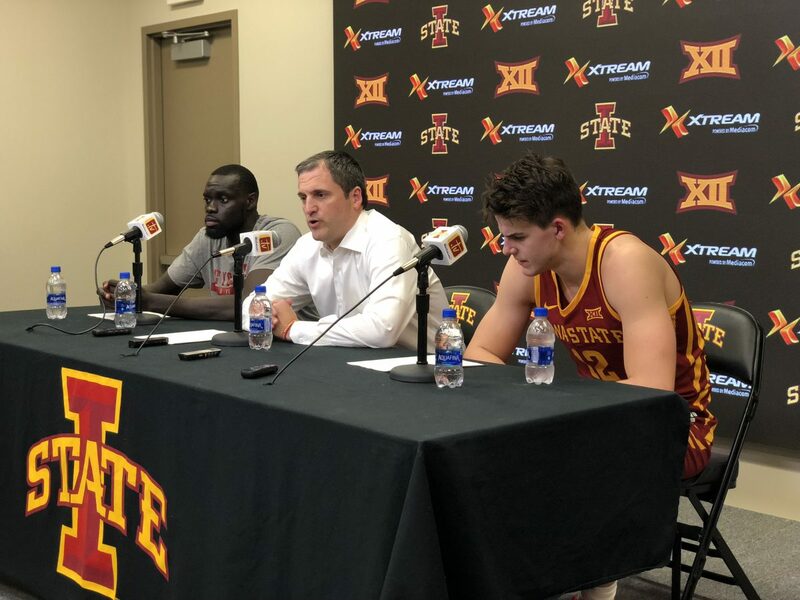 Two newcomers – sit out transfers from last season Michael Jacobson and Marial Shayok – led the Cyclones in scoring with 17 and 14 points. “I envisioned it for a whole year while I was sitting out so it felt great to get out there again,” said Shayok, a Virginia transfer who accounted for eight of Iowa State’s first 10 points in the game. Shayok went 6-for-10 from the field and 2-of-3 from long range. Jacobson comes off as a bit of a skilled garbage man. The Nebraska transfer was an efficient 7-for-9, showed the ability to run the floor, hit the outside shot but also muddy things up in the post. He’s a nice compliment to the rest of the Cyclones and should prove to be a key role model for a promising freshman class. 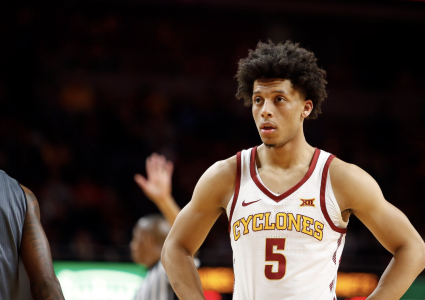 4 – The youth on Iowa State’s roster primarily accounted for a key 19-3 run in the middle of the second half which pulled the Cyclones away from their overmatched opponent from the SWAC. This specific lineup consisted of Wigginton, Haliburton, Griffin, Terrence Lewis and Conditt. That is three freshmen and two sophomores. 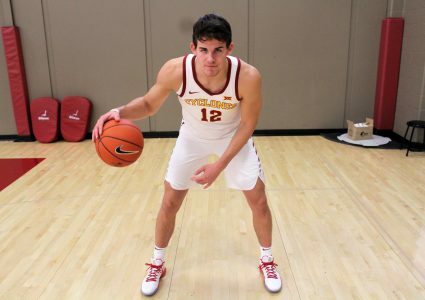 5 – The casual fan likely left Hilton Coliseum overwhelmingly impressed with Tyrese Haliburton. Haliburton, a long 6-foot-5 point guard out of Wisconsin, went 5-of-6 from the field, collected 12 points, four assists and four steals in 29 minutes. Haliburton’s length is a strength but the young man could stand to eat a cheeseburger or two. Personally, he reminds me of a young Naz Mitrou-Long due to his contagious smile off the court. 6 – I do wonder how the young bodies of Haliburton and Conditt will hold up against high-major competition. 7 – It shouldn’t be a problem for Talen Horton-Tucker. At 6-foot-4, 233-pounds, Horton-Tucker does not look like a freshman on the floor. He was a bleak 3-for-12 from the field on Tuesday, but Prohm said the Chicago native has been knocking down 40 percent of his 3-point attempts during practice. “THT,” did some nice things aside from scoring though. He had a beautiful steal which turned into a dime to Weiler-Babb early in the first half. He has a sweet step-back jumper. There is great chemistry among all of those freshmen. 8 – Here is why. Conditt, Griffin and Haliburton were all committed and officially visiting when Horton-Tucker, still a prospect, took his. It was the same day as the football game against Kansas last fall. Remember ….. it rained. Conditt, Griffin and Horton-Tucker are all Chicago products. Haliburton and Conditt were the first Cyclones off the bench. 9 – Enough about the newcomers for a bit. This is clearly Lindell Wigginton’s team. The super sophomore scored 13 points but continued his hot shooting from last year by going 3-of-6 from 3-point range. 10 – Unlike the start of last season, this Iowa State team appeared to have an identity. Ball movement and small ball – for now. Remember the disastrous first game at Missouri a year ago? No ball movement. No identity. 11 – Nick Weiler-Babb needs to be more aggressive. The senior only attempted five shots in the opener. In his defense, Weiler-Babb had four rebounds and four assists to go with the five points. This team will need more out of him to fully reach its ceiling in March. 12 – Prohm often talks about relationships but how does he build them? This came in reference to moving on without Young, Lard and Talley throughout the month of November. 13 – Considering the opponent was Alabama State, I thought the energy inside of Hilton on Tuesday was top-notch. 14 – Just wait until Friday … I’ve heard Hilton is close to being sold out for Missouri’s return to Big 12 territory. The Tigers defeated Central Arkansas on Tuesday night by a 68-55 final.